At the Rifflin'Hitch Fishing Lodge in Southern Labrador, Canada, every main entree and dessert is served in some sort of surprise dish making the appearance of the food look good. When you taste this sorbet surprise, one realizes the dish in which it is served in does not even come close to the taste of the dessert. The sorbet served on this night is delicately decorated with fruit and a dairy product, creating a fine display for the guests at the fishing lodge. 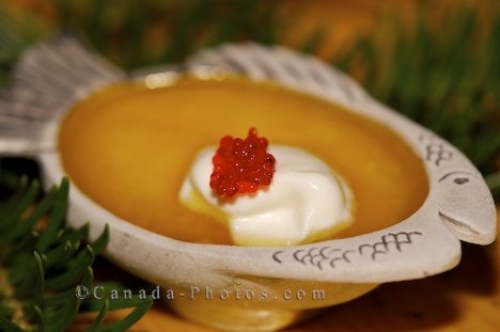 Picture of a sorbet surprise served at the Rifflin'Hitch Fishing Lodge located in Southern Labrador, Canada.